We're blessed to have visual stimulation of this magnitude throughout our city. It makes it infinitely more livable to be surrounded by beautiful things. Paris or Positano come to mind. While walking down Division, at Honore I came upon a group adding to our urban canvas. 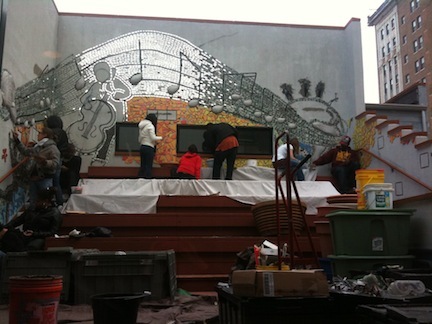 A mural was being born on the side of a building of what was once Anderson but is now LaSalle II Magnet School. An assemblage of students and what I assumed were teachers were laying out a grid that wrapped around the entire north wall. Intrigued, I stopped to ask some questions. 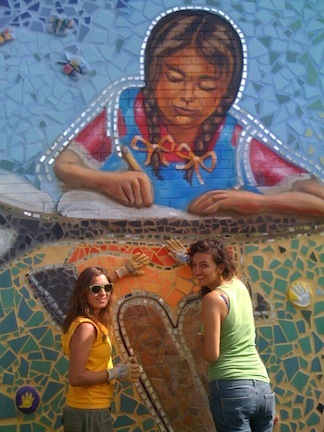 Who I thought were teachers turned out to be artists from the Green Star Movement, a non-profit organization dedicated to implementing mural programs with students that celebrate multicultural diversity, urban life and the natural environment. Partnering with schools, community centers and other like-minded organizations, Green Star Movement begins by holding workshops and interviewing the kids. Together they brainstorm on themes that are important to them -- be it music, history, teen pregnancy or whatever else they choose. Once decided, the four-to-ten week process segues into the execution phase. 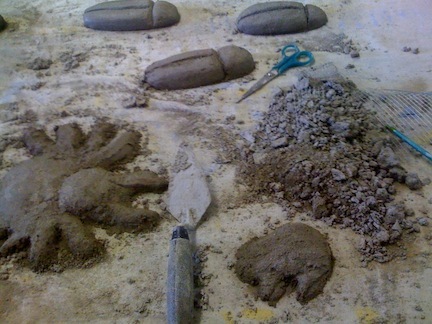 The kids research the subjects and work hard sketching, sculpting and then making and laying tiles and mirrors. With Green Star Project artists guiding them, they transform their ideas into visual forms. In the process they learn leadership and team working skills and gain a new-found respect for art. Creativity is like a muscle. The more you exercise it, the stronger it gets. 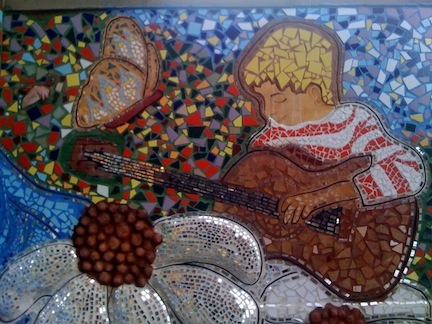 Starting out, many of the kids have no idea that you can make art for a living. That will change. One of the many values of programs like this is that they expose kids to opportunities they didn't know existed. Inspiration often becomes a new color on their palette. In Lawndale and Humboldt Park -- high risk communities where some of these murals are located, it's almost as if not much is expected from youth. School or home situations can be rough and it's hard enough just surviving. Participating in art projects like these helps build self esteem, and the positive influences gained multiply exponentially with each example. How much better off are kids doing this than playing Xbox? Art is empowering and in these days when public school arts based programs often fall victim to budget cuts and diminished public support, this communal type of guerrilla art helps redefine inner city neighborhoods and kids alike. With the majority of public schools in America reducing or eliminating electives such as the humanities, some forward-thinking principals and administrators have turned to other options to supplement what they know needs to be taught. The American education system is broken. We've fallen behind, value the wrong ideals and frankly are turning out lesser students compared to other countries. According to Wikipedia, a recent United Nations education index ranks the United States at number 20 and falling -- a sobering statistic. Both of the driving forces behind Green Star Movement, Kamelia Hristeva and Anna Soltys, are of European origin. During our interviews each mentioned how when they came to America, a place they choose to live and desire to give something back to -- they skipped a grade in school. The quality of their European education was at a higher level than ours. This was years ago, and it's only gotten worse. Neither of them knew this fact about the other prior to our conversations. Their unbridled faith, hope and efforts will seed the next generation though -- secure in the knowledge that their contribution has an affect on "the maximum amount of people in the most positive way", as Soltys puts it. And it's not just the kids that benefit, it's the neighborhoods as well. When a light goes on, it illuminates whatever is in its presence. Over the last couple months I've been watching their progress as the grid became sketches that turned into inlay that now tell a story on the wall. I'm very happy to see this in my neighborhood. Hopefully our illustrious gangbanger graffiti homies will see it that way as well and leave it alone and untagged. To date, none of the murals have been defaced. There are 12 around the city now, with eight more on the drawing boards. Hristeva envisions the city "linked by the murals as if by strands in a rope." One thing is fairly certain. These kids, the ones that are learning new skills and putting in the effort to create this art won't be defacing or vandalizing property. Far from it. Good citizenship lives in the 'hood alongside accomplishment and pride. 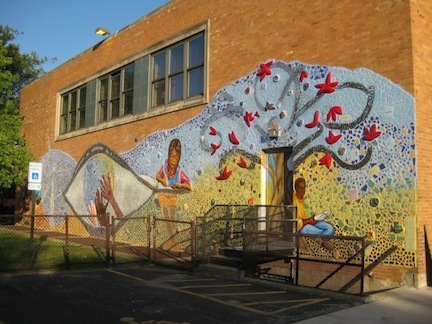 After School Matters, a pet project of Mayor Daley's wife Maggie and a supporter of Green Star Project, gives selected students a stipend to work on some of these murals, bringing kids together from all parts of the city in the name of art. Often it's their first job. It's well known that many of them turn over part of their paychecks to their families to help out. Lessons learned via Green Star Movement or After School Matters overlap into other areas of their lives and will benefit them forever. It should also be noted that children that are often viewed as "difficult" or that have "behavior issues" often flourish and even lead in these less than classroom-like environments. "Kids we've been warned about excel," remarked Soltys. Could it be that we place too much significance on rote memorization of facts and not enough on developing other outlets for our children? Perhaps we need to rethink the fundamental principles on how we educate students. Innovation and creativity should have the same status as literacy and cognitive skills. Intelligence is dynamic, interactive and distinct. Why then aren't most schools? Our values are misplaced. Our teaching methods out of touch. Everyone is good at something. It's up to us to help kids find their passions through self expression or by piquing their curiosity -- not label them ADHD and medicate them, or worse yet give up on them. Picasso said, "Most children are born artists. The problem is to remain one as we grow up." What if we guided our children on another path and encouraged them in ways that may not fit into present day American curriculum but that honors this aesthetic, the child as an individual with unlimited potential, at the very least good at something? What if we made it our jobs to nurture rather than stifle creativity like Green Star Movement does? Truly, then no child would be left behind. Map of mural locations, courtesy of the Green Star Movement. Alan Lake has been a professional chef for nearly three decades and has won numerous awards, professional competitions and distinctions. He's mainly consulting now, setting up projects like kitchen design, menu development, hiring and training staff, research, etc. He's also been a professional musician most of his life and coined the term "Jazzfood" to describe his "solid technique based upon tasteful improvisational abilities" and views his food as he does his music. Casa de Soul, a new record of all Brazilian material will be available shortly.